A picture frame containing the well wishes of your guests for all occasions: Weddings, Birthdays, Anniversaries, Christenings or something else. You tell us how many guests, you choose the frame and the background colour and we size and build accordingly. 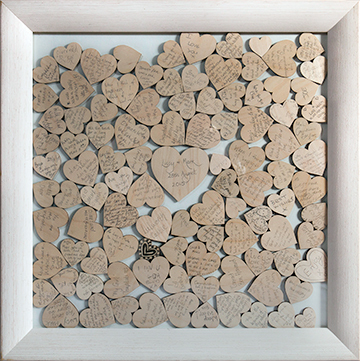 Each guest writes a message on a wooden shape (hearts, birds, stars, animals) and drops it into the frame, leaving you with a piece of art to display within your home - a perfect reminder of your special day. 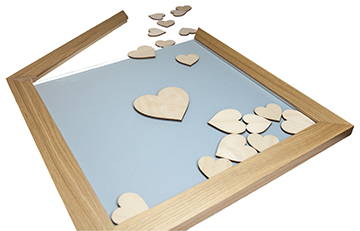 Unlike similar online products, we offer a personal bespoke framing service. Working on site, we can provide you with a unique handmade design to suit your personal requirements, home and theme of your special occasion.